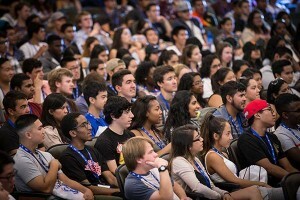 Freshmen attend orientation to learn about SJSU. A group of San Jose State faculty, students and staff are looking at a new way to offer general education courses to Spartans in their first two years on campus as part of the Educational Excellence and Student Experience priority. Katherine Cushing, an associate professor of environmental studies, got involved in the discussions about creating general education pathways around themes last spring. As a professor of water resource management, she said she was interested in working on a pathway related to sustainability. The other potential themes include creativity and global citizenship. Cushing said the University Sustainability Board members spoke at freshmen orientations over the summer to increase awareness of activities on campus and also mentioned some of the sustainability-related lower division general education courses. Joyce Lum, a business major, is also part of the committee focused on general education pathways. As an Associated Student Board of Director, she said she made an effort to get involved in committees to be a voice for students. As a business major she took GE courses in her first two years that related to globalization and sustainability. “When I took classes that were related to each other, I found it a lot easier to pay attention in class because I could actually connect what I previously learned with what I was currently learning,” she said. Lum said she wants to change the perspective students have of general education courses as she has heard negative comments from some students. “It’s disheartening to hear this because I know the professors that teach these courses are very passionate about teaching and knowledgeable about their subjects,” she said. The group working on the sustainability pathways has identified three clusters of courses that include climate change, sustainability policy and ethics, and art and sustainability. “We’re still in the beginning stages of coordinating these pathways, but I can’t wait to see it implemented,” Lum said.